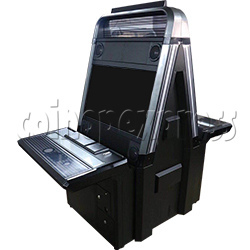 This Vewlix VS twin cabinet comes with all brand new parts installed, with high quality 32 inch high definition LCD monitor, Sanwa joysticks and buttons, and Jamma wiring for all your arcade game needs. We do not use "reconditioned" or used monitors, or, copy Sanwa joystick/buttons. Free ENGLISH version combo arcade game board (1299 games in total) included.